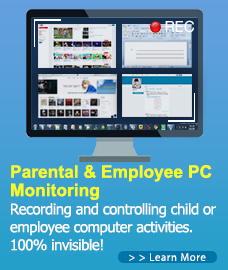 Home / Posts Tagged "Is PC Monitoring Legal"
Employee monitoring software has become commonplace. Many apps take monitor screenshots, capture online chat history, monitor active applications and visited sites and, in extreme cases, can even take pictures using webcam. It seems to be fair to track what your employees do when they are being paid for their time. After all, if they exchange their time for money, it seems fair for the employer to know what they are paying for. So, why does it still feel morally inappropriate in some cases? The question is far from being just theoretical. If a wrong decision is made, a company may suffer from lawsuits, experience a backlash and overall productivity drop (opposite from what was intended) from their employees or suffer damage to the company’s image. Read More: Is Employee Monitoring Legal? Silent employee monitoring is when information from employee’s computer is shared with company management without the user knowing it’s being shared. Transparent employee monitoring is when an employee has access to all his monitoring data. If you would like to improve the work efficiency, it’s good idea to inform your employees that they are being monitored and need to put their heart into work. Silent monitoring without consent is a simple case in which it is easy to distinguish between right and wrong. It happens when employee monitoring software is being used without a clear consent from the employee. If an employee is being quietly monitored and this fact is not stated in his contract with the employer, he has a full legal and moral right to sue his employer. But, even if mentioning it in the contract may make silent monitoring legal, does it make it morally right, if it was not brought to the employee’s attention and he is not aware that he is being monitored? The majority of employees would see it as wrong and rightfully classify it as spying. And, if you are a manager responsible for company policies in that respect, it would be prudent at least to make sure that every employee knows if he is being monitored and what the monitoring includes. The days when a big corporation could spy on their employees without their consent is over. Certainly, companies have the legal right to monitor their employees, but in order to win their support, smart companies give their employees control over the monitoring process. Only then would they see happy employees and increased productivity.